US, 1955, 89 minutes, Colour. Jane Wyman, Rock Hudson, Agnes Moorehead, Conrad Nagel, Virginia Grey, Charles Drake. 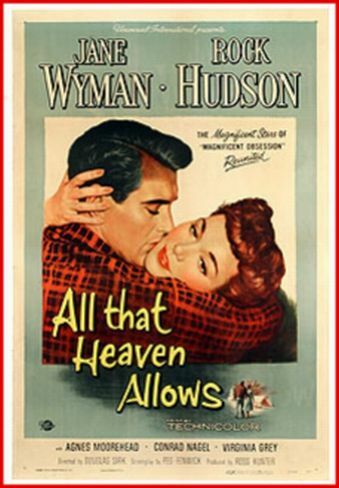 All That Heaven Allows teams Jane Wyman and Rock Hudson again after their 1954 success in the version of Lloyd C. Douglas' Magnificent Obsession. It was a romantic success and very popular. So also was this film. Ross Hunter produced at Universal many films for popular entertainment, especially "women's films". Douglas Sirk was to direct many of these throughout the mid and late '50s. He has since become a cult director, praised for his direct presentation of stories and their emotional content. This particular film was admired by Rainer Fassbinder who adapted it for Germany in the '70s and also for African migrants working in Germany in his Fear Eats The Soul. The film is presented with great professional gloss and is very attractive. At times, especially towards the end, it veers towards the melodramatic. However, it is a good example of well done soap opera of the'50s. 1. The significance of the title, its tone, themes of love and marriage and difficulties? Indication of themes? 2. The film's reputation in the '50s as a fashionable women's soap opera? Its reputation later? The fashionable and glossy style, treatment of popular themes, American society, the popularity of the stars and their working together? 3. The importance of the atmosphere of the town ? during the credits, the look of the ordinary American town with its exclusivism, its contrast of classes and status? The exclusive clubs etc., and the atmosphere that it creates? The contrast with the ideas of Thoreau and his Walden, with freedom, lack of competitiveness, truth to oneself? The use of colour, the piano music, the orchestrated score? 4. Audience involvement with the plot and with characters? How easy for the feminine audience to identify with Cary? For male audiences to identify with Ron? The repulsion for the snobbery of the town? Involvement in the love story? Reaction to the selfishness of people especially Cary's children? Response to the fears when marriage seemed elusive? Regret at lost opportunities? 5. How recognisable was the town and its emphasis on status. class, snobbery, gossip? The value of appearances and being within the group, within the fold? The status of happiness as acceptability within this group? Sarah and her friendship with Cary and her being the intermediary with the group? The contrast with Mona and her love of gossip (and the enjoyable tone of her gossipy tongue? ), the club and the various people there and their behaviour, Howard and his flirting? Harvey and the possibility of Cary's marriage to him? 6. How was this reprised later with the party at Sarah's, in contrast with the party at the club? The people looking out the window to see Ron, the acid comments? People's cruelty, motives for commenting on people? How well did the film expose this kind of cruel snobbery? 7. The contrast with Mike and Alida? Having Thoreau's book on the table? Alida's speeches about the meaning of life, the Korean war, competitiveness and the rat race, unimportant things, being true to oneself? The touch of the sermon? The contrast with competitiveness and big business? Cary and her long time taken in accepting this, her sacrifice of herself for her children, her illness? How did this contrast with her joy at the party at Mike and Alida's, the wine, the singing, the dancing, the wide range of people present? 8. Jane Wyman's style as Cary? An attractive middle aged woman, the emphasis on her age, on her being a widow? The comments about Egyptian widows being walled up and what American widows did? The possibility of marriage with Harvey, conversation, cocktails, his health, his refined manner and not pressurising? Her relationship with Ned and Kay, as children, memory of their father, their careers? Her relationship and friendship with Sarah? The round of social outings in the town? The set to which she belonged, being accepted, traditions, business and wealth? How tied in was she to this set? Why was she attracted towards Ron, the sequences in the garden, the shared coffee, going out to see the trees, the fascination with the mill and her redesigning it? The gradual change in her, the visit to Mike and Alida, her inability to fully move away from her own place ? the doctor's comment on her being ready for a love affair but not for love and marriage? 9. Rock Hudson's style as Ron, his presence, courtesy, love for the trees, taking Cary out, showing her the mill, his presence at the party, with his freedom, sequences together especially at the mill and the happy weekend, his proposal? Sarah's reaction to him and her change? The children and their rudeness to him on his visit? The party and the snobbish attitudes and his being hurt? The build up to his making Cary decide and his being disappointed when she left him? 10. The portrait of Ned and his competitiveness, Kay and her incessant psychological chatter, her fiance and the contrast with her mother and forbidding her mother to marry? The irony of telling her mother that she shouldn't have let her get away with it? Ned and his leaving, the selling of the house.. the symbolism of buying the television set? The blind selfishness of the children? 11. Cary and the sequences of her loneliness, the Christmas tree and the encounter with Ron, her fear that he was marrying the younger girl, her illness and her visit to the doctor? 12. The contrast with Ron and Mike out shooting and the advice that Mike gave and the counterpoint with Cary and the visit to the doctor? The irony of her presence, Ron's accident and their being brought close together? The symbolism of the deer outside the mill house at the end? 13. An attractive film, soap opera, persuasive, involving? The values of human life, love and marriage that it proposed? A critique of competitive American society?